Last week, I introduced Archbishop Dionysius Latas of Zante, a Greek hierarch who visited America in 1893. When we left his story, he had arrived in New York City and was en route to Saratoga Springs, where the Episcopalian Bishop Henry Potter had invited him. We’ll pick up the story there. My impression of your country? Well, I started long before the date of meeting in Chicago, because I was so anxious to see America, and the longer I stay here the more I congratulate myself on this resolve. There is just one way to sum up my ideas as impressed upon me by this great city [New York City], and that is you Americans travel along much quicker than we do in Europe. Your rate of progress has not only enabled you to catch up in the comparatively short existence that the United States has enjoyed, but you have outdistanced us. Within a few days, Abp Dionysius had made his way to Washington, DC, where he hoped to meet President Grover Cleveland. As it turned out, Cleveland was out of town. A Washington Post reporter caught up with Abp Dionysius, and observed that he had “a jolly face, a hearty laugh, and although he cannot always understand questions in English, he is quite communicative” (8/12/1893). He had decided to write a book about his experiences in America, and aimed to publish it upon his return to Greece. The Post reporter watched as the archbishop’s “scribe” (presumably his deacon) copied his Greek text. “It is very hot here,” said the archbishop, as he mopped his perspiring forehead. It was hot enough for him in his native land, he added, but there he spent his time in the country. He thought the country the best place in America as well, and with evident delight told of his visit to the Catskills in company with Bishop Potter of New York. The archbishop spoke in high terms of America and Americans, and he evidently meant what he said. He had been impressed by the hospitality and “good heart” of the people in this country. “Americans and Englishmen are different,” he said. “The Englishman is like this,” and then he drew in his head and put on a stiff, gloomy, and morose expression, which was comical in the extreme. “But the American,” he continued, changing his mood, “is always this way,” and the archbishop burst into a hearty laugh to illustrate what he meant. “How long will you be in America?” he was asked. “Perhaps three months,” was the reply, and the perhaps possibly meant if he did not go broke before that time, for he added that it cost a great deal more to travel here than elsewhere, and explained that what took a franc across the ocean requires a dollar here. From Washington, Abp Dionysius returned to New York and then departed for Chicago, to attend the World’s Parliament of Religions. I just came across a site on Buddhism in German(! ), but it has a nice picture of the Congress, where our archbishop seems to be the second on the right of the podium. Btw, is there any record of any interaction between Met. 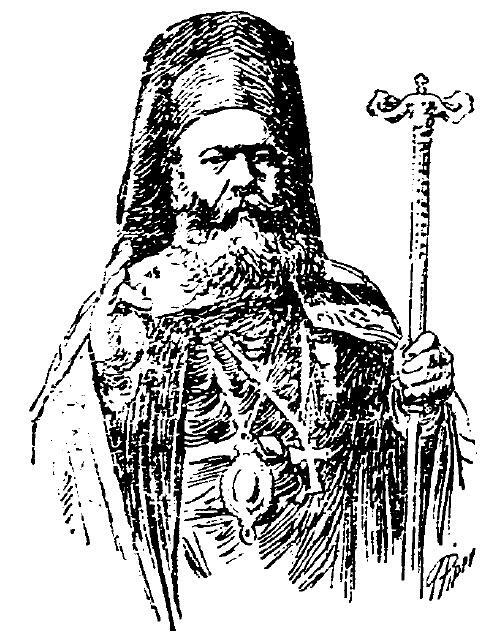 Dionysios and the Russian Mission here, as he passed through San Francisco, at the time the see of the Diocese? Isa, I’m unaware of any interaction between Dionysius and the Russian Mission. I know that Bp Nicholas Ziorov visited the Chicago World’s Fair, but it was before the Parliament of Religions, and Bp Nicholas didn’t attend the Parliament (citing previous commitments, but possibly wanting to diplomatically avoid the potentially scandalous ecumenical gathering). I’ve found nothing on Dionysius in the online archives of Holy Trinity Cathedral in San Francisco. You would think that there would have been some sort of interaction, but I have yet to find evidence of any.